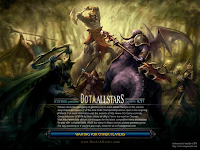 Dota-Allstars 6.52 Beta 5 map leaked, free download in this blog as always. Hmmm, looks like in this version IceFrog more concentrate on cosmetics and likely will add anti pooling system. Some change on item tooltip and item details. Not much change on heroes until now. Let's just wait until another Beta released. - Teleporting to a building (using a TP scroll) now shows a white ping-type notification on the minimap for your allies. Loading screen will look like v6.51's, but you will see differently in the top right corner when the game loads. Recipe items can be purchased with a full inventory. Begun separating items' effects (what it gives [e.g. +5 strength]) from their stories. Not completed for every item! On this map, looks like every player mark their items. So, you cannot get the other players items (pooling). Let's just see until another Beta. Update: Official Dota-Allstars 6.52 Map already launched!!! The Treads change is somewhat nifty; can see what you're using at a glance. New players should have an easier time with items now, I suppose. Nice to see IceFrog catering for beginners with changes that also help everyone else. More Power to this Blog~! Aye aye, one my personal favorite sources for DotA info. Thank you! i think there's a bug in this map. lol its funny whenever you kill roshan, another will spawn directly and not after 10min !! Gee.. My suggestion on the Power Treads change of color icon was implemented..
After last roshan being kill will hv no more roshan??? is there any more item can get from roshan??? Thank you for the latest update~! ++ recipe buying with full inv. The extra money you have at the end of the game should only be used for buying your hero, nothing more (after you buy all the items you want, of course). man the anti-pooling means that when your item drops they cannot also be attacked ?? it would be great to have a divine then dont care about dying !! I thought my suggestion is dull.. I like this blog. It reminds me when I saw my first suggestion (Disassembler in couriers and "-swapall") being implemented in the game with the beta map leaks here. i thought the oficial Dota v6.52 map is almost done? its almost the end of april but still no map yet... hope its done on or before may 1.
i see. thanks for the info, i haven't read the statement of icefrog about the major bugs..